Grace needs a change of scenery. She lost the love of her life and after two years she's still unable to start living a little again. That's why her best friend takes her to an archaeological dig for the summer, to work as a volunteer. Grace is a history teacher and digging up remains of a Bronze Age settlement is exactly what her friend thinks she needs. Is she right and will Grace's new surroundings have a healing effect? Duncan can finally start digging where he's always wanted to. He's a professor and the site director. Being on the Yorkshire Moors brings back a lot of memories of the past. Because of a traumatic experience Duncan has the reputation to be gruff and unapproachable, but when he meets Grace something inside him changes. He wants to be kind to this brave, but broken woman. They understand each other's pain and together they can turn the summer into something interesting. When a missing person makes everything Duncan has been through come to the surface once more, it's Grace who can save him. What will they uncover while digging together? Living in the Past is a fabulous story about time, grief, hope and love. I was intrigued by the setting straight away, an archaeological site is a wonderful place for a story and I could easily picture every part of it because of Jane Lovering's fantastic detailed descriptions. Being part of Duncan's project suits Grace and soon she discovers she can play a key part in revealing the past. I was curious to find out where that would lead and couldn't stop reading and really loved that Living in the Past managed to captivate me so much that I forgot everything and everyone around me. Grace and Duncan are both damaged and sad. They deserve happier times and meeting one another is the beginning of something good. I liked the way they slowly form a connection. It's clear from the start that they find comfort with each other. They talk and are honest about their feelings, which was beautiful to witness. I admired their bravery to risk getting hurt again, while they already went through much pain because of their pasts. They have a precious bond, which made the story incredibly special for me. Jane Lovering has a mesmerizing writing style. She skillfully makes people, settings and emotions come to life. I love how enchanting her stories are. She has the amazing ability to make everything she writes about feel real. I felt like I was on the Yorkshire Moors, watching the dig. She also transported me to another time and place just as effortlessly. I admire this gorgeous ability, which turns every story she writes into a treasure. Living in the Past is a wonderful novel filled with mysteries, history and love. I highly recommend this terrific book. If you love stories set in the present and past filled with history, love and hope you don't want to miss Living in the Past. Jane Lovering was born in Devon, England but, following extradition procedures, now lives in Yorkshire. She has five children, four cats, two dogs and doesn't believe in housework so the bacteria and dust are approaching sentience and now rank among the pets. Incidentally, she doesn’t believe in ironing either, and the children all learned self-defensive cookery at early ages. She works in a local school and also teaches creative writing, which are extreme ways of avoiding the washing up. Published since 2008, she writes romantic comedies which are often described as ‘quirky’. One day she's going to find out what that means. 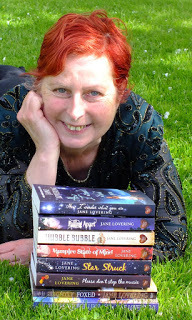 Jane is a member of the Romantic Novelists' Association and has a first class honours degree in creative writing. In 2012, her novel Please Don't Stop the Music won the Romantic Novel of the Year Award by the RNA. I’m Jane Lovering, and I live and work in North Yorkshire. I write books that I describe as ‘dark psychological romance, with jokes’ and everyone else describes as ‘quirky romantic comedies.’ My books vary from magical realism to contemporary, with a couple of paranormals thrown in and are mostly set in and around York and the North Yorkshire. I live in a big, rambling old house with my animals, from where I can see both the Moors and the Wolds. It’s also quite cold. 2) Living in the Past is a story about history and time, why have you chosen these themes? I’m a huge history buff, Time Team’s biggest fan, and fascinated by prehistory, when most of what we know is conjecture. I have a Foundation Degree in Archaeology, and wanted to write about a distant historical period to highlight the fact that, however much time passes, people are still people. So, pulling it all together gave me the idea for setting part of the book in the Bronze Age, and part in modern times, to contrast how, although we are separated by millennia, we still behave much the same! Besides which, not much is known about the Bronze Age, so less chance of someone telling me that I got my facts wrong! 3) Can you describe the main characters of Living in the Past in eight words each? Grace – widowed, grieving, control-freak (that’s only one word, honestly), no-nonsense (so is that), teacher, sympathetic, confused, moral. Duncan – archaeologist, professor, muddy, scared, angry, Scottish, surly, empathic. Hen – healer, loss, disappointment, life-or-death, love, observer, past. Tor- leader, strength, father, guardian, hunter, responsibility, torn, lover. 4) You write stories in different genres, how do you decide what your next story is going to be? I don’t know that I really *do* decide. I just get an idea for a story, and it is in whatever genre it happens to be. For instance, writing about the Bronze Age, it could either be a historical or a timeslip. Writing as a timeslip means that the reader can be grounded in the modern day and also get a taste of life four thousand years ago. If I’d written it just as a historical, it might be hard for readers to empathise with characters. So the story led the genre. 5) If you could travel back in time, where would you go and what would you do? Hmm, that’s tricky! I’d love to go back to the building of Stonehenge and Durrington Walls, and find out what the thinking and mythology was behind the building of those, but I also have a small hankering to go back to Edwardian England, meet some of my relatives and see how life was for them in the not-too-distant past. Although, of course, there’s always Elizabethan England because, well, frocks. 6) How do you combine your busy family life with your writing and critique career? I never do any housework. 7) You’ve won several prizes with your books already, how does that feel? Winning an award is amazing. It’s just such a wonderful feeling to think that other people like what I have written! It’s a boost to the morale, and also makes me think that, yes, I really *should* go on with this writing thing, since I seem to be quite good at it. 8) When you’re giving manuscript critiques, what’s the most commonly made mistake? Telling the story, rather than showing the reader what is happening. It’s such an easy mistake to make – humans are born storytellers after all, and the most natural thing in the world is to tell. But readers want to feel part of the action, as though they are watching things unfold in front of them, rather than having someone tell them the story. 9) How did your writing journey start? I read voraciously as a child and used to try to copy some of the stories I read, only re-writing them to insert myself into the action or give characters I really liked a bit more to do! I’m just finishing off a new novel set in Dorset. It’s got a TV star, a camper van, a dog called Brian, a teenager, Christmas and a café in it. Then I’m plotting out the book after that, which looks to be a bit Gothic and set in Yorkshire around an ancient water source. I may also eat some HobNobs and walk the dog a bit. One very lucky reader of With Love for Books will receive a digital copy of Living in the Past by Jane Lovering. It sounds like a great read. Working on a dig was a childhood dream of mine.I can't wait to read it! Living in the Past sounds like a fantastic time-slip story of grief, friendship, love and time travelling. Would love to sit on the balcony reading this in the sunshine with a lovely coffee and some chocolate!! It sounds a really hopeful book! Sounds a great book and I can't wait to read it and see the story it uncovers and how the time-travel reveals itself. It sounds like a good book I'd be happy to read. I love your red hair, Jane! Love archaeological and history, sounds great. 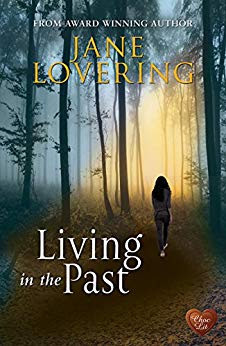 (Living in the Past by Jane Lovering - Book Review) This drew me right into this book; Living in the Past is a fabulous story about time, grief, hope and love. I was intrigued by the setting straight away, an archaeological site is a wonderful place for a story and I could easily picture every part of it because of Jane Lovering's fantastic detailed descriptions. Being part of Duncan's project suits Grace and soon she discovers she can play a key part in revealing the past. I was curious to find out where that would lead and couldn't stop reading and really loved that Living in the Past managed to captivate me so much that I forgot everything and everyone around me. great review. I can't wait to read this now. "Self-defensive cookery"? That's so funny! I completely share your attitude to housework, Jane!